1). Dexters are about half the size of most American cows. That means that they eat less, poop less, are less destructive to fences and equipment and generally less dangerous to be around. 2). They give birth easily. I have only lost two cows that failed to deliver in over 10 years. 3). They are a hardy breed. They survived Scotland and Ireland, so Alabama seems rather tame to them. They acclimate well. Temperatures here range from 0 (zero) to 105 degrees (F). They live outside, in the rain, year round. They prefer a little shade, but who doesn’t? So, with all that is so right about Dexters, what do you need to know about breeding them? There are two “gotchas” in this wonder-cow. I have included links above to the ADCA discussions on these issues for those who want a detailed explanation. 1). PHA- We have never seen a case of PHA or known another breeder who has had one. Obviously, it’s out there, but to a much less extent than Chondrodysplasia. 2). 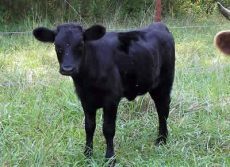 Chondrodysplasia – We have had two bulldog calves from the same bull and two different cows. We also had three normal births from each cow and that same bull. In other words, we fit the statistical profile for the risk inherent in breeding for short-legged Dexters, until that particular bull died from a leg injury. More recently, Duke, our bull out of a short-legged Father and a long-legged mother, is producing calves that are sometimes short-legged and some times long-legged. 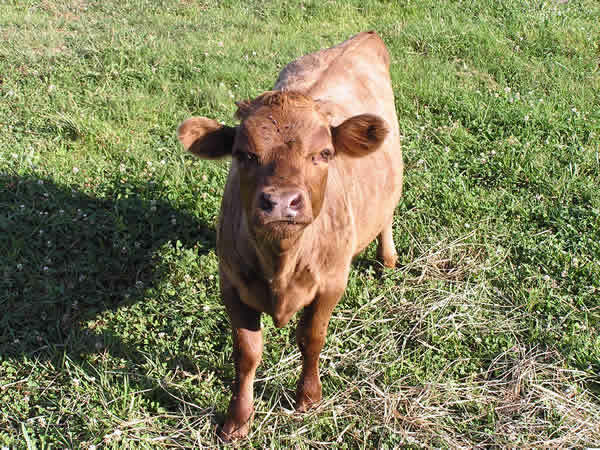 We have had short-legged bulls from Duke and a long-legged mother and long-legged cows from Duke and a short-legged cow. Again, this fits the genetic table of what one would expect. The final caution is that in breeding short-legged to short-legged, there is a one in four chance of a bulldog calf. In any other combination, you won’t get a bulldog, but you can’t really predict what you will get. So, in breeding Dexters, you need to decide how much you like the look and temperament of the short-legged Dexters. Most Dexter breeders really like the look and don’t think much about the temperament. Our experience has been that the long-legged Dexters tend to be a bit more “skittish” than the short-legged. They can be trained, as can most cows, but it was easier to get the short-legged girls to stand still for milking. Of course, I still I have had to bribe them with food and confine them to a stall, but I usually didn’t have to chase them. We don’t worry about color. 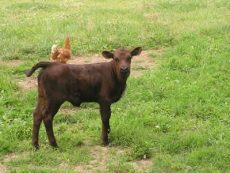 Our cows range from golden to brown to red to black. If you want the details on how the color genes work, see the ADCA color page. Be advised they will fool you. Here is long tall Sally at age 1 month. Hard to believe it’s the same heifer. She is out of black Duke and golden colored Cassidy. Cassidy is a short-legged cow, but this gal is going to be a long-legged track star. She runs like Lady Murine, her grandmother. If it’s really important to you, pay to have the animals DNA tested for color. There’s still no guarantee that you will always get what you want, but you can more closely increase the odds.